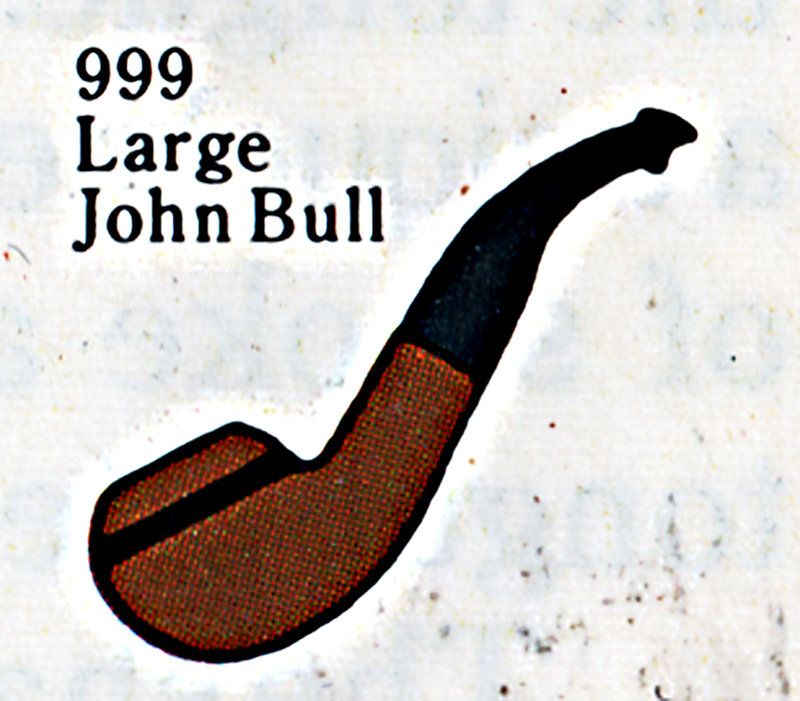 I always find myself thinking of the classic 999 John Bull (pictured above) as typical of Kapp & Peterson’s house style with its short, beefy shank, chubby tapered mouthpiece and P-Lip. 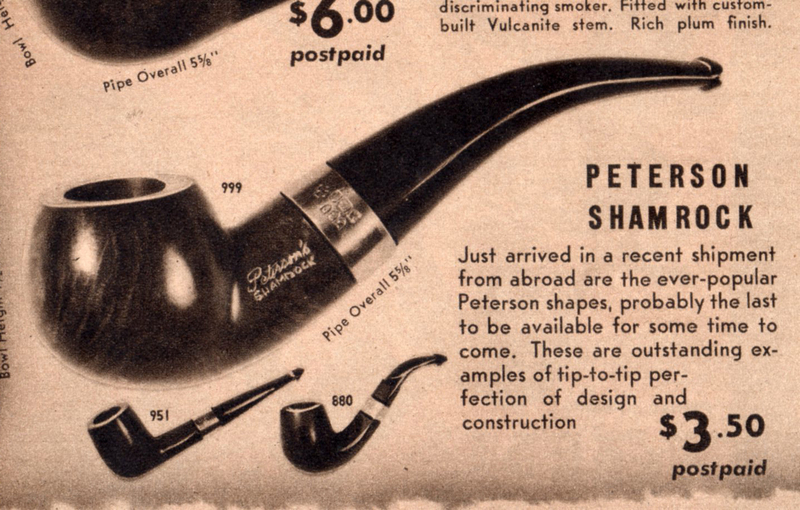 Unlike other iconic Peterson shapes, however, it seems unlikely that this one was an original. Collectors more knowledgeable than I know there were many English and French makers who also made a shape very like it, if not earlier, then at about the same time beginning in the 1920s or 30s. 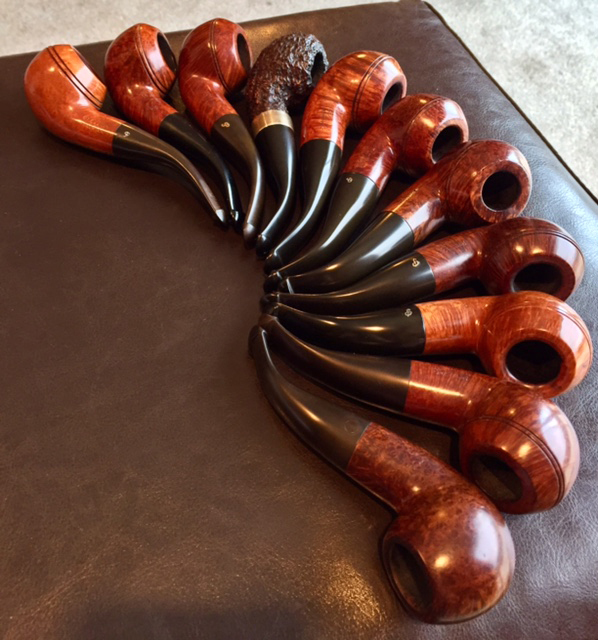 Al Jones has several favorites, including GBD’s 9242 and 9438, Comoy’s 499, and Sasieni’s Ashford. And if you play with the design a bit, you can come up with a number of variations and more than one name by which the shape is called. 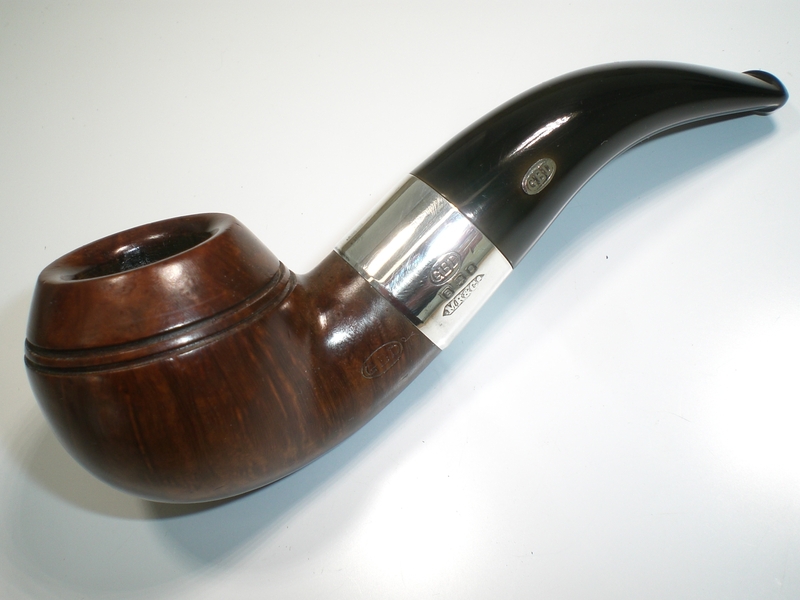 Many American pipemen call the 999 a rhodesian, although at BriarWorks they call it a bullmoose. But Greg Pease, perhaps thinking of Tracy Mincer’s Custombilt pipes, would say a bullmoose has a forward-jutting chin and is usually sporting a saddle bit. For Pete Freeks there is fortunately away out of this etymological muddle: what has Peterson always called it? It usually just goes by its shape number, but when Peterson has given it a name, it’s always the same name: John Bull. Note also that whenever the two shapes pictured above are named in the K&P ephemera—which is from 1947 to 1992—they’re always given the same names. Diamond-shank? Pete freeks, that’s a Rhodesian Bent. Round shank? John Bull. 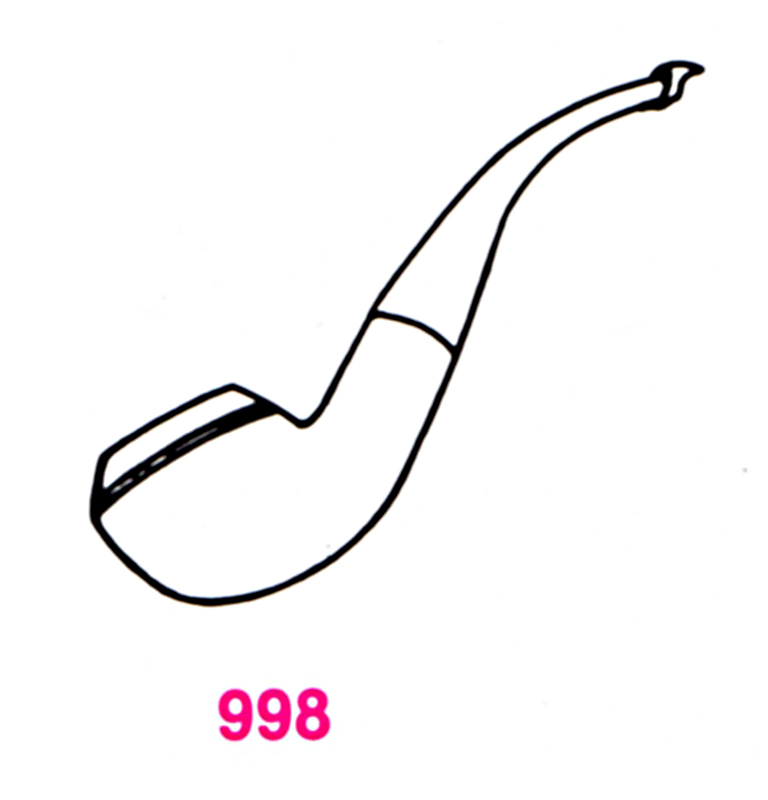 But while the song (or name) remains the same, the fact is the 999 pictured in the 1992 brochure illustration above was not the first nor even the second shape given this number, but the third. Thanks to Steve Dundish and his remarkable 999 collection, it’s finally possible to document all three shapes and shed a little light on the number’s history. 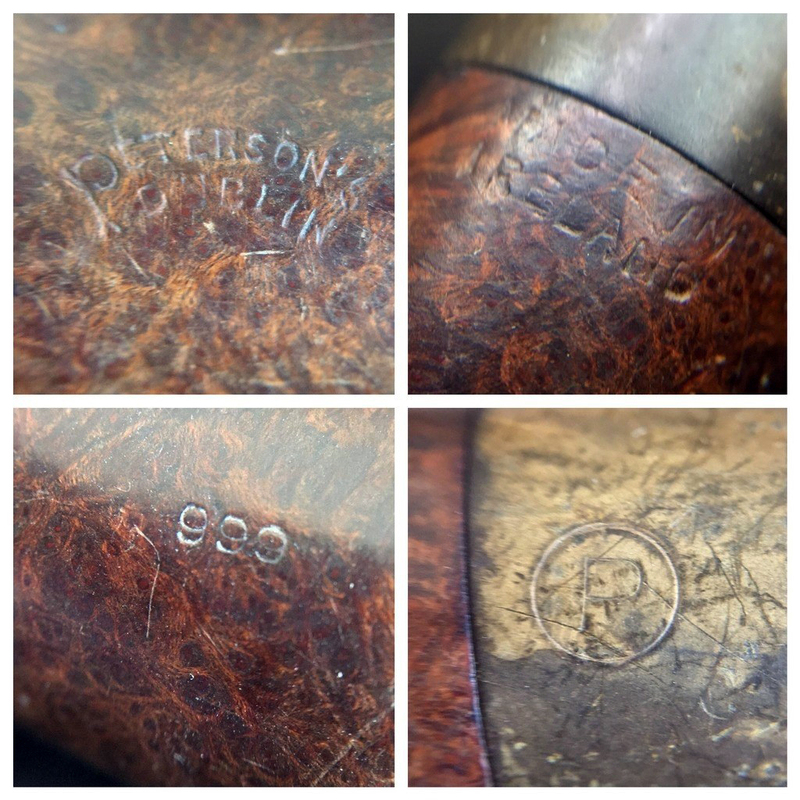 The 999’s entry into the Peterson catalog may not be just a coincidence, either. 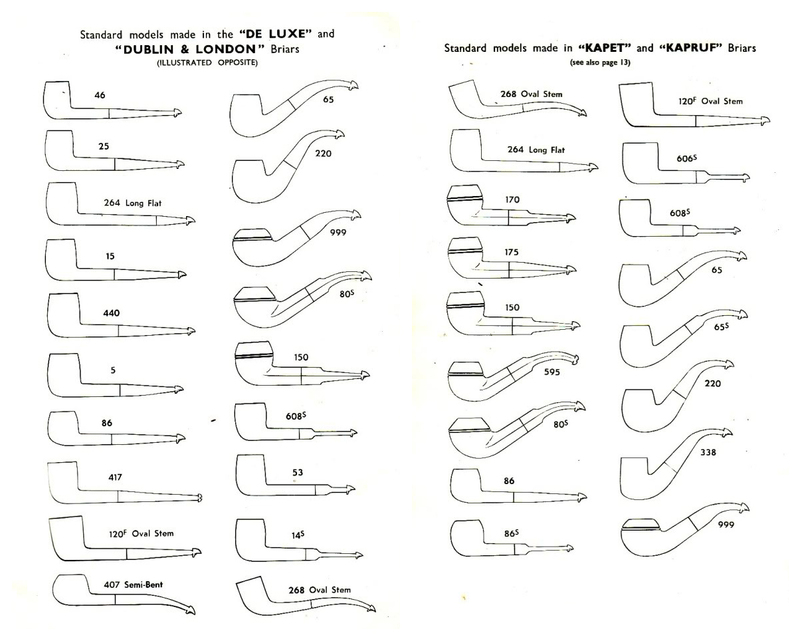 The London factory had just opened (as the book will explain in further detail) to manufacture pipes for the English market, and what more natural than to do than make sure Peterson has on offer a few fashionable English shapes? 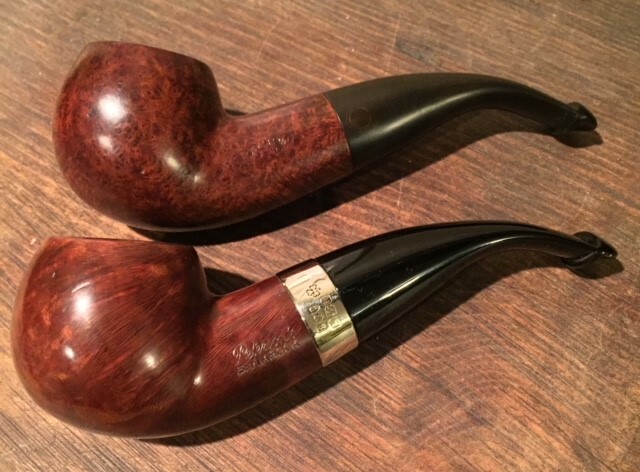 That both of these author 999s are from US Rogers Imports lines, and that the author version of the 999 isn’t seen in any Peterson ephemera outside the US, brings up some questions: did the factory make the shape exclusively for the US market (which may be the case with the 9BC and the 02BB)? Or did K&P or Rogers Imports change their minds about the shape after the war? I doubt we’ll ever know. The Shamrock line, according to Rogers Imports Ltd. copyright information, seems to have been in production as early as 1938, while their Captain Pete line began c. 1940, giving a few time to get to the States. 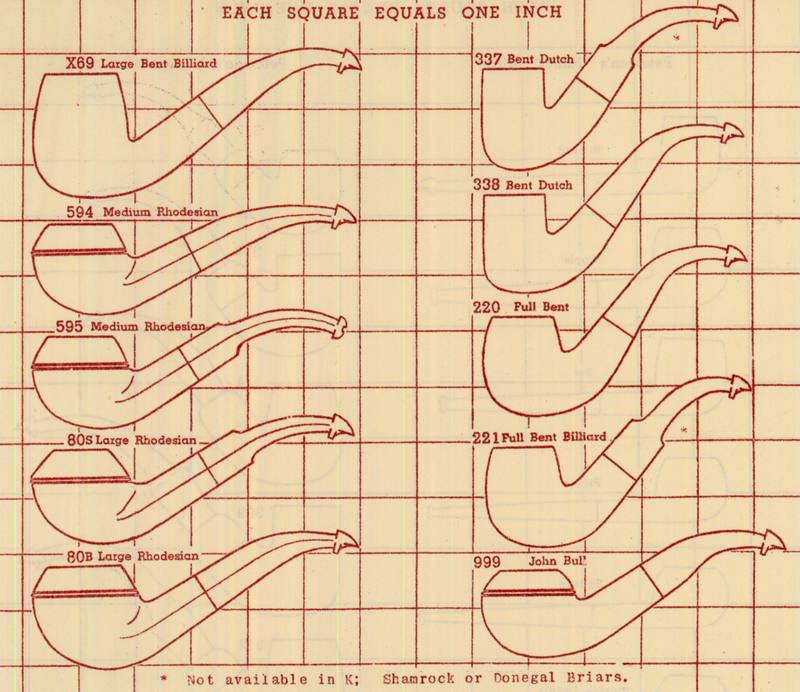 As the stamps reveal on Steve’s pipe (seconded by Gary Malmberg’s documented research), Captain Petes were not made solely by the London factory (contra Pipephil.eu). “MADE IN IRELAND,” both Gary Malmberg and I agree, is what is typically found on the Rogers Imports pipes, rather than the “ÉIRE” stamp one would otherwise expect for these years. Length: 5.31 in. / 135 mm. Length: 5.25 in. / 133 mm. Bowl Height: 1.69 in. / 43 mm. Bowl Height: 1.63 in. / 41.38 mm. Bowl Width: 1.5 in. / 38 mm. Bowl Width: 1.80 in. / 45.91 mm. Chamber Depth: 1.25 in. / 31.75 mm. Chamber Depth: 1.30 in. / 33.10 mm. 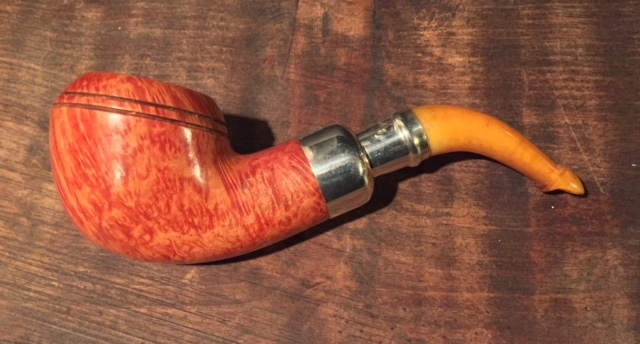 There are three interesting things to note about Steve’s author Shamrock 999: first, the K & P maker’s mark in shields on the nickel band, which throughout Peterson’s history have typically been reserved for sterling mounts. Nickel bands and mounts typically were stamped with just the plain “K & P” maker’s mark. 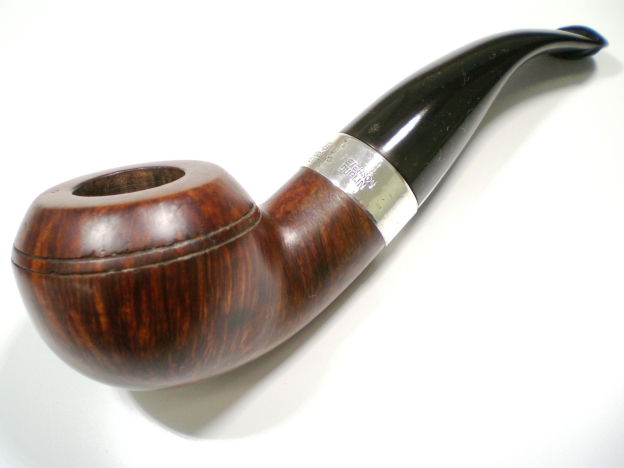 Second, Steve’s pipe has a P-Lip, while the George Yale has a very untypical fishtail. The third thing I want to call your attention to is the tenon extension. Traditionally (if not during the Dublin Era), tenons and mouthpieces have been of great importance to Peterson. This one, while molded and not a bone screw-in, features the extended “chimney” so crucial to correct tenon-mortise airflow for the P-Lip mouthpiece. 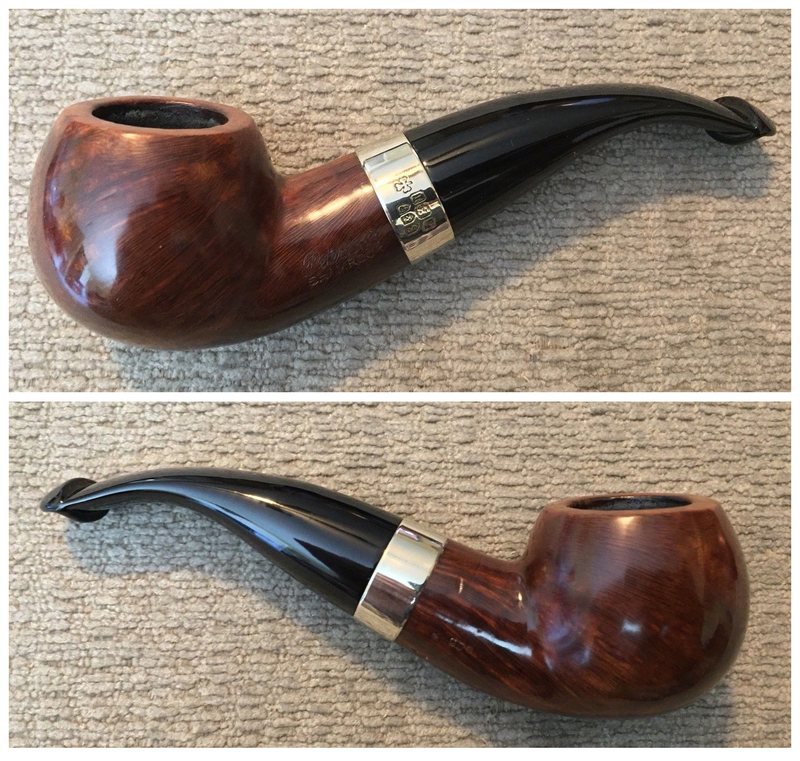 The graduated bore of the P-Lip as well as this extension makes the pipe a “sub-System” (as we call it in the book), which means that it will perform considerably better than a traditional fishtail. 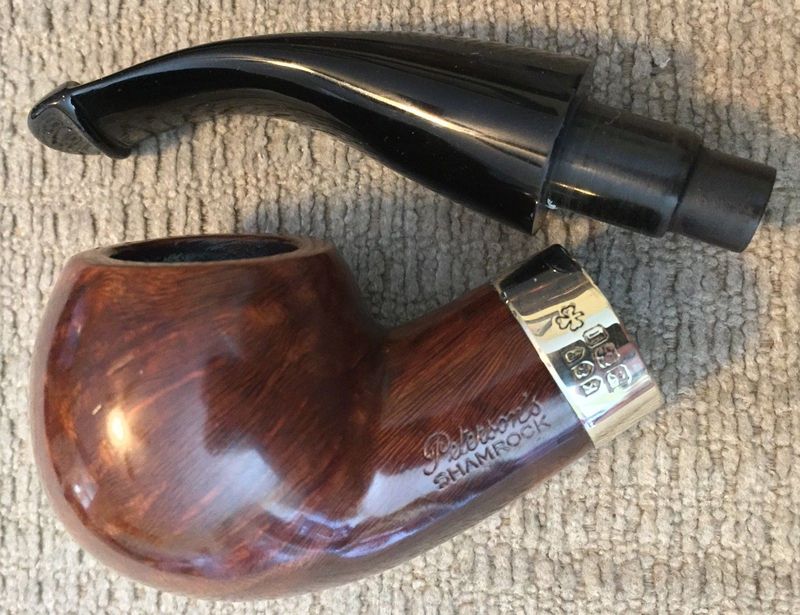 This type of molded extension goes all the way back to the original molded-stem Patent mouthpieces, incidentally, and doesn’t seem to have disappeared (alas!) from the Peterson workshop until the 1950s. This may have been due in part to the fashion of implanting stingers, and not merely to brand amnesia, but whatever the reason, it is unfortunate. The author version of the 999 was never made again, and so remains the most elusive of the 999s and one of the rarest production shapes ever made by the company. In fact, I could never quite believe in its existence until Steve sent photos of his—despite its appearance on the George Yale page—thinking perhaps it was something the company intended to put in production, but never carried out when hostilities made it impossible to export their pipes to the US. The “Product Line” (entry-grades) “K,” Shamrock and Donegal Rocky lines had all made their appearance by this time. As production geared up, K&P would continue to expanded its lines, adding the John Bull to a broader spectrum including (in approximate order of quality) the Supreme, Premier, Sterling, Killarney and Auld Erin. Another thing to note in the photo above and in all of Steve’s photos is the variance in the stem bends, which is actually just a bit maddening. Just a casual glance at this photo reveals at least six different bends. At the tenon end most of these measure about .90 in diameter (23mm), which must make them among the thickest of production mouthpieces. (The nearest to that in my rotation is the Sherlock Holmes Baskerville, at about 0.85 in.) They must have been extraordinarily difficult to bend. I’ve only clenched a few, but my favorites have the little twist at the end of the button, which seems to make them hang more effortlessly. There also seems to be some variance in the width of the button-end mouthpiece–my dark Shamrock is wider than my Killarney. Still in all, it’s a really comfortable pipe in the teeth and in hand. Aside from their very real visual appeal, I think there’s two more ingredients that have made the classic Large John Bull so popular: it’s extremely comfortable in hand and has an exceptionally wide button, spanning between 15 and 17mm, making it a really easy clench between the teeth, especially when the button has the slight downward turn seen in so many of them. 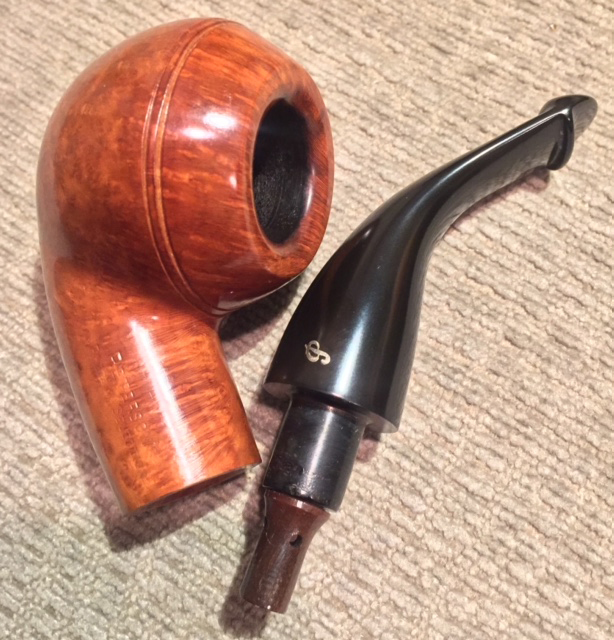 In fact, I don’t think there’s another mouthpiece in the Peterson arsenal that beats it, although the “Comfort P-Lip” on the original 301 Systems from the late 1970s equals it. There’s enough classic John Bulls on the estate market that with a little perseverance and luck, you can usually bag one in a month or two if you’re persistent. And you’ll usually pay only a fraction of the price that similar shapes in one of the fashionable marques like Comoy’s, Sasieni or GBD demand. 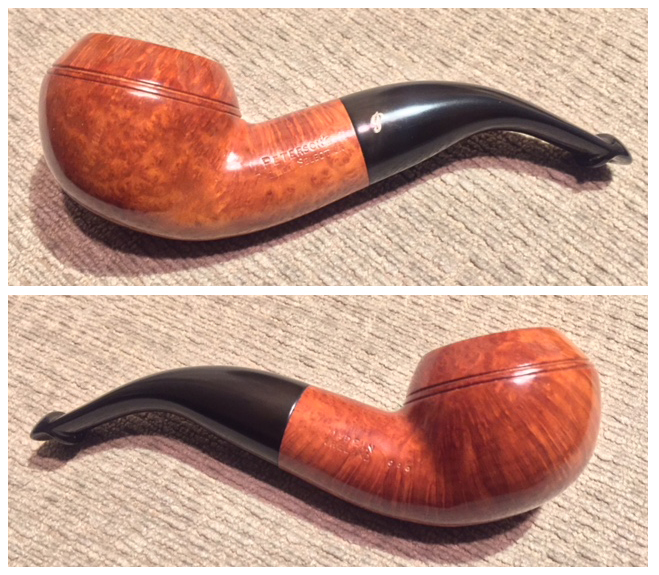 Maybe someday Peterson will see fit to restore this fine and richly-deserving shape to production, embodying as it does all the best marks of the classic Peterson house style. and to Al Jones for sharing his passion & knowledge of the shape.